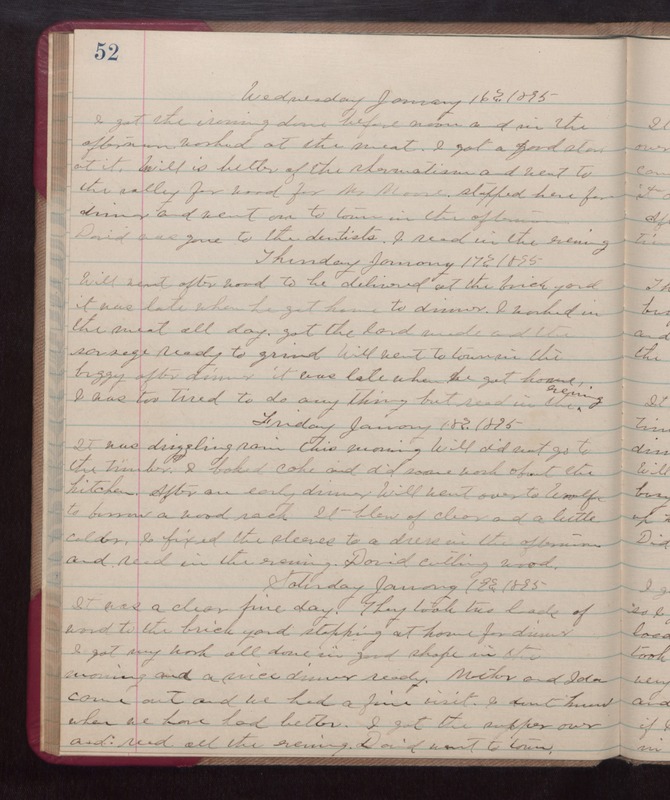 Wednesday January 16th 1895 I got the ironing done before noon and in the afternoon worked at the meat. I got a good start at it. Will is better of the rheumatism and went to the valley for wood for Mrs. Moore, stopped here for dinner and went on to town in the afternoon. David was gone to the dentists. I read in the evening. Thursday January 17th 1895 Will went after wood to be delivered at the brick yard. it was late when he got home to dinner. I worked in the meat all day. Got the lard made and the sausage ready to grind. Will went to town in the buggy after dinner it was late when he got home. I was too tired to do any thing but read in the evening. Friday January 18th 1895 It was drizzling rain this morning. Will did not go to the timber. I baked cake and did some work about the kitchen. After an early dinner Will went over to Woolfs to borrow a wood rack. It blew of clear and a little colder. I fixed the sleeves to a dress in the afternoon and read in the evening. David cutting wood. Saturday January 19th 1895 It was a clear fine day. They took two loads of wood to the brick yard stopping at home for dinner. I got my work all done in good shape in the morning and a nice dinner ready. Mother and Ida came out and we had a fine visit. I dont know when we have had better. I got the supper over and read all the evening. David went to town.